Absolutely phenomenal knife! Great quality and as sturdy as can be! Highly recommend! Just received the knife. The pictures don't do bit justice. .I have been collecting knives for years and I have never seen this quality before ..Thank you for first class attention/communication and super fast shipping. ..I couldn't have asked for a more beautiful hand crafted knife . Hey Mark. Merry Christmas. I just wanted to know I field tested the Persian you made me. I field dressed and completely quartered and deboned a buck I shot yesterday and the blade preformed flawlessly. It’s still razor sharp. Mark knife arrived this Am .The pictures on your site do not do it justice..this is a thing of beauty!!! Absolutely love it and so happy i decided to give you my business.. you are an artist and so easy to do business with. thanks again for such a nice piece of work.. I cant stop looking at it... happy memorial day to you and all your veteran brother and sisters! I gave it to him last night and he absolutely loved it! Thank you again for everything, I could not ask for a better knife for my dad. Black Mamba YOU ROCK !!! i couldn’t be more pleased with my Black Mamba knife. It is a masterpiece and completely flawless. Finding a quality, hand made in the USA with pride product at a great price with good customer service is almost impossible. I feel very lucky to have stumbled onto Mark’s shop, and we will be customers for as long as he keeps hammering them out. Mark is very personable and communicative throughout the whole process until the product gets to your door. Thanks again Mark, and please don’t retire for a while we have more work for you! I received my Bowie knife today and from the time I open the box was impressed. Your packaging and letters for care of my knife and the thank you letter impressed me. The communication was flawless just like the quality of the knife. Your A jewel in the knife industry waiting to be found. Black Mamba and Mark made this the easiest and best purchase i have ever made. I will be back for another very soon. Not only good looking but works flawless in the field. P/S if your looking don't go past these knifes they are well priced and quality is way above price. Buy a Black mamba you won’t be unhappy. 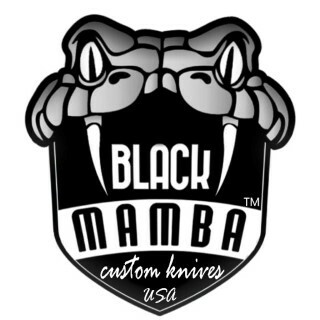 I have now purchased my sixth Black Mamba knife- 5 Persian Yumas/ 1 Kabar and more planned in the future. As a collector, I can appreciate a high quality, well constructed knife. These knives have these qualities but along with it beauty as well. If you are a hunter, these knives are extremely sharp and most likely be great for skinning. If you are a collector, just looking at these knives brings to mind works of art. The Damascus is flawless. The spacers in the handles are perfectly matched and are absolutely flawless along with the stag. The knives fit perfectly in your hand- buy one and you can easily see this. They would also make an impressive side arm as the sheaths are high quality as well. Contact Mark- you can’t go wrong buying one of these beauties. I was always afraid to order a custom knife but was ready to take the chance. So I had A damascus steel straight razor and A damascus fishing filet knife made by Mark from Blackmamba Knives. Today when I opened the package and saw the both of them how beautiful they were. I could not be happier. I explained to Mark email what i wanted we exchanged a few pictures and picked the woods i wanted and told him lengths. They were exactly as I envisioned. Bot are razor sharp. The packaging was also done well they were packed well both oiled to preserve the damascus and handles. They even came with beautiful natural leather sheaths. Inside was a nicely written thank you letter and a two page letter on how to care for my knives. Mark GREAT QUALITY AND WORKMANSHIP AND ATTENTION TO DETAIL.. I would definitely order from mark again. I received the first Red Dragon Slayer- it's hard to describe the quality and finish of this one. Mark has created a masterpiece with this knife. He has taken Damascus steel to the next level. The Damascus guard is integrated into the blade like nothing I have ever seen. The stag handle is a work of art and makes this creation very colorful with the Damascus a perfect blend. The shape of the blade makes the knife look incredible. I mentioned to Mark that I had been collecting knives since 1976 and this one makes number 1000. It is a fantastic work of art to help me cerebrates this milestone. You have to order this one- it will not disappoint! This is More than “JUST A KNIFE”. This knife is a piece art that has amazing function! I own many mamba knives and have never been disappointed in any of them . Mark is a master craftsmen and takes pride in his Work and has always been a man of his word his communication is the best. Thank you for the help in all my projects. Purchase one you will not be disappointed! I bought a customized BMK-420. The balisong has the right weight and balance for basic flipping. The blade is half double edged (the upper side is half edged but not too much sharpened). The other blade is razor sharp. The leather sheath is very nice. Overall e very good knife. BMK-106 Received in new condition as advertised with fine leather sheath. Thanks Much! Overall, pleased with the knife. Very sharp out of the box. The box should come with a warning: “Sharp edge. Handle with care” . Sliced my thumb open wiping some oil off the blade. Has good action. The tang pin cups are a bit too large resulting in loose latch lock-up in the open or closed position. The leather sheath that came with the knife is very nicely made. I would have preferred adjustable/removable pivot pins like what’s pictured rather than the hidden pins. The overall look is cleaner with the hidden pins but I like to be able to adjust the pivots as the pivots tend to loosen up with use and I won’t be able to adjust it as needed. Still, I am very pleased with the knife especially with the fairly quick turn-around time and the price. Any of my nitpicking will be addressed with my next order which I plan on doing soon. Thank you. Just received this knife in the mail and like I stated on Facebook, I know quality when I see it. This knife is a Christmas present for my daughter and she will be thrilled to get it! how to care for it!! Beautiful knife. perfect attention to detail just received as a Christmas gift very excited to carry and use daily . Will definitely be put to the test being in my possession.Feels way to nice to use as a daily knife but hey all things that are nice need to get used only to get better get character and than pass on thank you for making such an awesome knife ! I received the "Dragon Slayer Bowie" today and words could not express how I felt when I opened the package. The smile on my face was ear to ear. Box was nicely packaged and shipping only took 2 days for delivery. Mark was great to work with and did a remarkable job on this knife. From end to end the fit & finish of this Bowie is outstanding! Although a big knife, it feels really comfortable and well balanced in the hand. I highly recommend this seller! Hi Mark! I received your gift yesterday (TSETSE FLY neck knife) and was pleasantly surprised you actually took the time to personalized a note for me. Thank you for doing that as it means a lot to me as a customer and it shows how you value people in general. Both of these knives (TSETSE FLY AND DRAGON SLAYER) are absolutely gorgeous and displays high level craftsmanship on your part. My nephew is going to love this knife! I look forward to doing more business with you in the near future! I thought shipping was delayed so I contacted the owner he contacted me in a very timely manner. The night came with some instructions great packaging and very well oiled. The craftsmanship is beautiful and I would love to buy from him again. Exceptionally detailed workmanship and the fastest shipping I have ever experienced. Thank you again ! Very beautiful knife. Got it as a gift for my boyfriend and now will need to order one for myself. Very cool knife. Everyone that sees it is impressed. The Chef knife I bought for my brother-in-law is amazing. He loved it...first present I’ve ever bought him that he really, truly loves!!! Great quality, my husband loved it! However the note I wrote out for him to read when he opened it wasn't placed in the box. I was pretty disappointed about that. Bought as a Christmas present for my nephew (I have three). He loved it!!! Excellent service. Fast shipping. Beautiful craftsmanship. Will definitely be making more purchases from this shop. I know zero about knives but I wanted to get one for my boyfriend who knows about what it takes to make a great knife. After reading the reviews and googling I went for it. He was amazed by the quality of the blade, handle and even the leather case. I think he was more amazed I picked it out! This was a great purchase! It was a gift for my boyfriend and he absolutely loved it. It's beautiful and well made. Fast delivery too. Looking forward to watching him use it daily. Such a beautiful knife! I am so excited to give to my partner, who is a collector! Thank you so much! I will be back to shop again! Thank you for the prompt shipping! It is a true piece of art! It is a Christmas gift for my husband, so I'll let you know his response! Amazing this guy makes quality knives and goes above and beyond for your satisfaction. My knife came oiled In a sealed bag with great packaging and a cover for the tip. Amazing absolutely amazing.